In the Form Change/Transformation theme the artist wants to study different ways of creating works of art that, in the broadest sense, change their form, colour or medium. 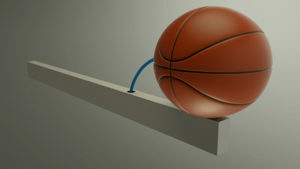 ‘Basketball on an Aluminum Beam’ is the visualisation of a basic concept. 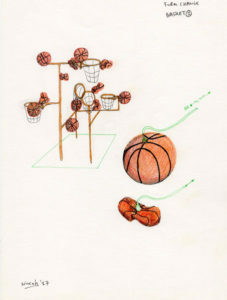 A basketball is mounted on an aluminium base and connected to a pneumatic system. The ball is alternately blown up and let down at a very slow speed, so that the object seems to have a solid form. 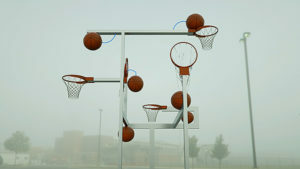 ‘Basketball Sculpture’ is a further elaboration of the basic concept ‘Basketball on an Aluminum Beam’ also a 3D-animation of an idea. In both works the artist might decide to make it an installation at a later date. 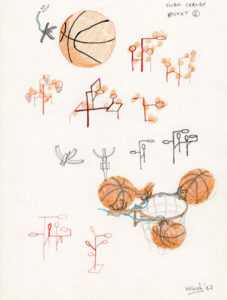 A number of basketballs and rings are mounted on a metal base. The balls are moved pneumatically and independently. They are permanently blown up or let down, resulting in a change of the overall structure of the sculpture. Expansion and shrinking are so slow that the sculpture seems solid and yet it slowly changes its appearance. Posted on October 1, 2017 at 12:17 pm.